Compared to normal sheeting, Diamond Reflective Sheeting is far more crease resistant and incorporates a diamond diffusion pattern for more even light reflection, preventing "hot-spots". This Diamond sheeting is the superior choice for your garden. 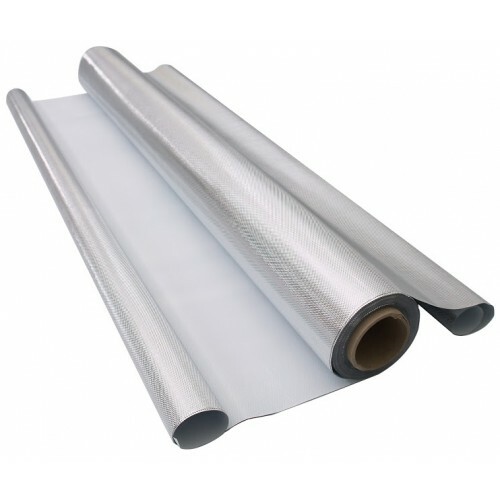 As an added bonus, Diamond Reflective Sheeting is 100% light tight and can be used to prevent light leaks from your grow-space. An internal thermal layer provides some heat insulation from one side to the other. Diamond Reflective Sheeting can be hung around your grow space and indeed anywhere in your grow room on walls, even on the ceiling, in fact anywhere that light needs to be reflected back towards the garden. Diamond Diffusion Foil can also be used over windows etc. to prevent light escaping from your grow-room. The thermal layer will also help extremes of hot or cold affecting your garden and will also help stop heat in your garden from leaking out. Please note: In order to keep the delivery cost to you down to a minimum, this item is taken off the roll and loosely folded to fit into our packaging. CAUTION: Diamond Diffusion foil contains layers of aluminium and will therefore block or severely inhibit mobile phone, radio and wireless broadband signals from areas covered with this product.